All stainless steel sewer saddle for HDPE pipe. 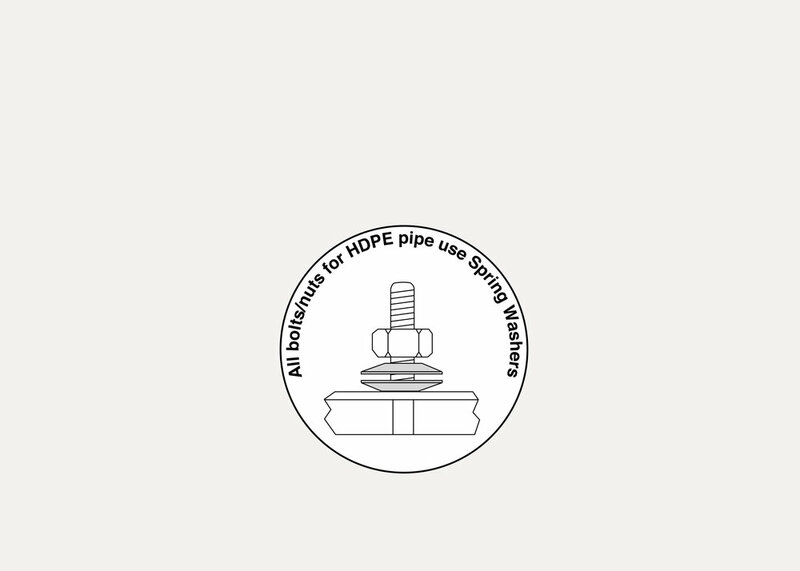 The BP uses spring washers to help compensate for pipe contraction during temperature and pressure changes. OUTLET SIZES 4" - 6"
COMPATIBILITY For use on HDPE pipe with a minimum wall thickness of SDR32.5. WORKING PRESSURE Pressure rating of the pipe up to 10 psi. NECK 304 Stainless Steel. Fused to shell with GMAW welding. Shell 304 Stainless Steel, 18 gauge. SIDEBARS Heavy gauge 304 Stainless Steel, GTAW welded to for permanent fusion with shell. LUGS 304 Stainless Steel, fused to sidebars by GMAW welding. BOLTS 304 Stainless Steel, 5/8" UNC rolled thread. Bolts are MIG welded to sidebar. NUTS 304 Stainless Steel, 5/8" UNC threads. Nuts coated to prevent galling. LIFTER BARS 304 Stainless Steel, lip curved to hold position while tightening. Heavy gauge serves as bearing surface for nuts. SPRING WASHERS 5/8" 304 Stainless Steel spring washers manufactured from a special grade of Stainless Steel used in the making of springs. PLASTIC WASHER 5/8” plastic washer prevents galling between spring washer and lifter bar. GASKETS Gaskets are made from virgin Styrene Butadiene Rubber (SBR) compounded for water and sewer service in accordance with ASTM D2000 MBA 710. Other compounds available for petroleum, chemical, or high temperature service.